Freefly has spent the last several years making some of the most impressive handheld gimbal-based stabilization systems and high-end drones for use with cinema cameras and advanced DSLRs. Today, however, Freefly introduced the Movi, a small stabilizer for your iPhone that brings their gimbal tech to the masses. While Movi borrows its name (perhaps a bit too heavily) from the company's several-thousand-dollar MōVI gimbal system, this one is clearly a consumer product but does manage to pack in some neat features. Going head-to-head with DJI's OSMO Mobile, the Movi is a bit pricier at $299 compared to $199. But its features may outweigh the cost difference. 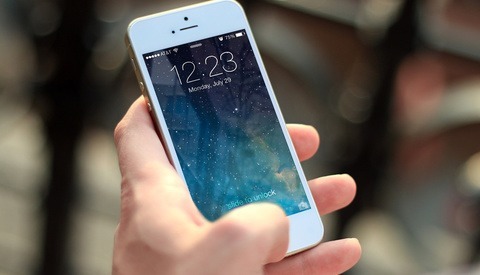 Rather than providing a purely handheld setup, Movi creates a base for your iPhone that can be set down stably on a table and out of which rises a control handle that rests to the side of the phone. 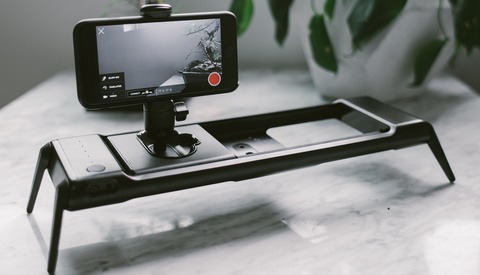 The handle features buttons to start and stop recording as well as to change the direction of a phone in a variety of modes that help smooth, stabilize, and/or straighten footage. While you'll get the most out of Movi by shooting in the dedicated app with features such as object tracking, you can still get rather advanced stabilization while shooting in any app with the Movi powered on. One immediate concern is the decision to go with D-pad-like buttons for movement controls. Time will tell if this provides adequate control for users or if a joystick-like control would have provided better flexibility for camera movements that are not purely vertical or horizontal. A standard tripod screw mount also allows Movi to be connected to a tripod, but the most interesting feature, perhaps, is Movi's ability to stabilize and hold itself single, fixed position. Other systems will move around slightly as they remain balanced, but Movi promises to be able to hold a precise position without moving. This lends itself to also being able to move in precise ways between multiple fixed positions that might be close together in order to create perfect time-lapse videos (or photo sequences). These movements can be programmed and are perfectly repeatable for retakes. This is why Freefly refers to Movi as the "ready for anything cinema robot." If it works as advertised, this really is like a robot. And from a value perspective, Movi impresses in the way that it essentially combines a DJI Osmo with a Syrp Mini for your iPhone. Of course, the Syrp product will also add movement controls for a DSLR-sized camera, but bringing this functionality to mobile phones in one package is impressive nonetheless. Unfortunately for Android users, Movi won't work fully for you, however, as the app is currently iPhone-only. Movi costs $299, with orders open now for delivery in the second quarter of 2018.
good thing it's hollywood approved. we all know we need their approval on everything. I like the form of it (being able to rest it somewhere relatively flat is nice), but that D-pad is a no go. I can't imagine why you would want that over a joystick. I got a little nervous as soon as I saw this article as I just purchased the Osmo Mobile last night, but I'm happy with saving $100, having the joystick, and also having it now rather than in the spring. Where does the microphone go? I dunno about this. Maybe useful for serious film makers, but then surely serious film makers would be more interested in using more capable cameras than their smart phones? The Osmo can do that. I posted a couple stories on IG from a trip to Belize I took a while back (rented the gimbal to see if I'd like it). I'm not sure, but in a Facebook Live video that Freefly did, it actually seemed to hold a vertical position like that for a moment in there. But I don't remember perfectly....and it would still probably be a bit odd with the main handle above or below the camera...but who knows? Looks pretty cool. I saw a review video where they had some small counterweights to balance it. Sounds ridiculous considering it's an iPhone but they had them. Any insight on that (are they necessary, are they included, etc. )?